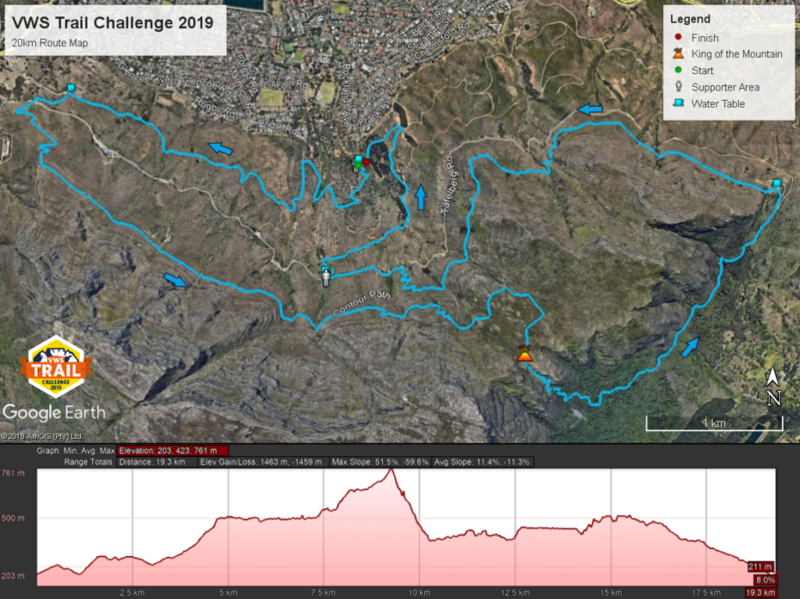 The VWS Trail Challenge 2019 is designed as a trail run with stunning views over the city of Cape Town while enjoying invigorating trails on one of the 7 Wonders of Nature, Table Mountain. The routes are similar to last year – with a very slight lengthening at the end for a more controlled finish – that present a great running (or walking) experience to all who dare to partake in this great event. Take in the beauty of Deer Park, the lower slopes of Devils Peak and Table Mountain, the single-track contour above Tafelberg Road and experience the majesty of early morning Cape Town.Organised and run entirely by us, volunteer wildland firefighters, all proceeds go towards our organisation, an entirely volunteer-run, non-profit entity dedicated to the protection of biodiversity and the preservation of our natural heritage. We receive no official or municipal funding and all funds (raised by our volunteers, via donations or events like this) are used for operational and logistical expenses when fighting devastating wildfires in the Western Cape. 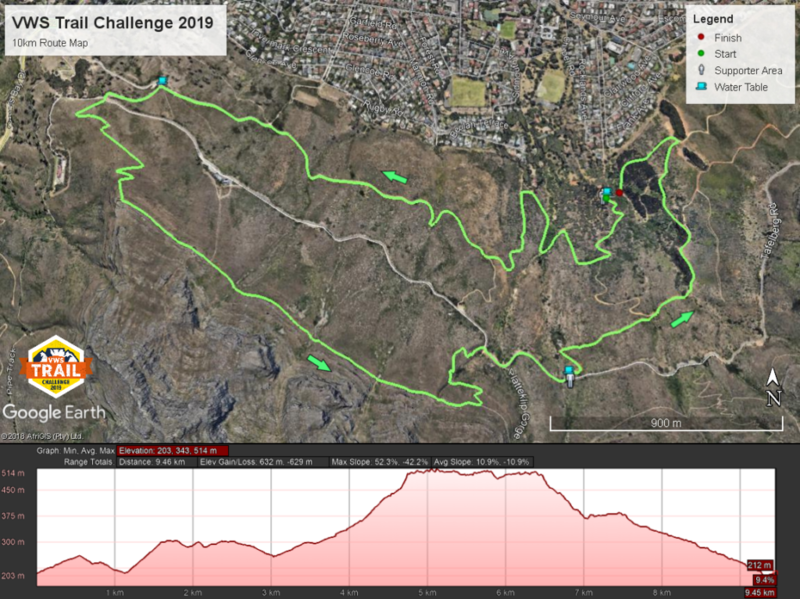 The Trail Challenge offers runners a chance to do two routes: 20km or 10km (runners and walkers), with the race start and finish located in Deer Park, Vredehoek. Any donations are welcome and would be greatly appreciated. You can also purchase an awesome VWS Trail Challenge designed tubular bandana to wear on the day, or as a reminder of a great day out! Limited water on route. Hydration Pack essential. Limited water on route. Hydration Pack recommended. There will be prizes for 1st, 2nd and 3rd place for each race, for both male and female runners and a King and Queen of the Mountain for the 20km Race. There will also be random spot prizes for any runners and walkers (especially mothers running on the day) at the prize givings. We will do two different times to award the spot prizes based on when runners / walkers are finishing. The route starts in Deer Park. The runners head up the hill along the undulating jeep track and towards the S-bends on Tafelberg Road below the cable station. the S-bends runner will head along the tar road for a very short sections, and re-join a single track above the Mocke Reservoir. The runners will continue up Kloof Corner until they reach the contour path above Tafelberg Road. At this point, they turn to the east and run in the direction of Devils Peak. Runners will cross over the Platteklip Gorge path and continue on the upper contour ascending the route up onto the saddle between Devils Peak and Macclears Beacon. Runners will head over the saddle and descend via Newlands Ravine. Upon descending this ravine, the route heads back east and travels around Devils peak on the contour path. This Route is a combination of single track and boardwalk. Runners will ascend past the Kings Blockhouse and re-join the Contour path travelling back in the direction of Deer Park. Runners will continue along this route until reaching the Devils Peak Path, at which point they descend to Tafelberg Road again. From the road, the runner will travel approximately 500m before descending down the jeep track and making their way back to the start / finish line. There is a slight change to the end of the race this year (making the race a few hundred meters longer) but this will allow for a more controlled finish and less congestion right at the end. The route starts in Deer Park. The runners head up the hill along the undulating jeep track and towards the S-bends on Tafelberg Road below the cable station. the S-bends runner will head along the tar road for a very short sections, and re-join a single track above the Mocke Reservoir. The runners will continue up Kloof Corner until they reach the contour path above Tafelberg Road. At this point, runners turn to the east and run in the direction of Devils Peak. Just before the Platteklip Gorge path they descend to Tafelberg Road again. On the road, the runners will travel approximately 350m before descending down the jeep track and making their way back to the start / finish line. Please note that by submitting your entry form you declare that you are physically and medically fit and able to participate in this event and assume all risks of such participation upon yourself. You participate in the race at your own risk and hereby indemnify the organiser, officials, all race helpers, all sponsors, the national and provincial race bodies, local authorities, SANParks, Table Mountain National Park and the Volunteer Wildfire Services (and its members) against any injuries or any other claim whatsoever which may arise as a result of your participation. The Volunteer Wildfire Services reserves the right to cancel the race (without refund) if the conditions on the day do not allow for the race to be run safely (or should there be a large wildfire at the time of the event). All entrants must be in possession of a race number, issued by the organisers, which must be worn on the front of the runner’s shirt. Participants must keep to the designated race routes (as indicated in the race maps) at all times. Marshals and traffic officials must be obeyed at all times. Failure to comply with these instructions may lead to immediate disqualification. No seconding shall be allowed on the route. Some refreshment stations will be provided however each runner is required to have sufficient water for their own needs. No littering permitted at any stage. Failure to comply will lead to immediate disqualification. Damage to Flora/Fauna or any historical site will lead to automatic disqualification. No unauthorised cyclists, vehicles, rollerblades or scooters will be permitted on the route. It is the responsibility of each participant that he/she is medically fit and healthy to participate in the event. The Volunteer Wildfire Services reserves the right to accept or reject any entry. Minimum age of 16 for the 20 km race. Minimum age of 14 for the 10 km race. Between 12 and 14 y/o allowed if accompanied by guardian. While the Volunteer Wildfire Services places participant and member safely above any other priority or obligation, Volunteer Wildfire Services will not be held liable for any injuries.